In play on Saturday, Ottawa downed Pawtucket 5-2. Matt Ginter went 6 innings giving up 3 runs on 10 hits. He walked 1 and struck out 5. Mike Bumatay went 2 innings giving up 2 runs on 4 hits. Hee-Seaop Choi led the offense going 2 for 4 with 2 RBI. Portland got by Bowie 3-2 in 12 innings. Jay Johnson, just promoted from Greenville, went 3 for 5 with 2 RBI. The 2 RBI came on a single in the 12th inning to give the SeaDogs the win. David Murphy went 2 for 5 with a home run. David Pauley went 7 innings allowing just 1 run on 2 hits. He struck out 6 while walking 3. Edgar Martinez pitched 2 scoreless innings giving up a single hit. He struck out 2. Kevin Frederick got the win pitching just a 1/3 of an inning. Wilmington edged Winston-Salem 4-3. Andrew Pinckney went 2 for 5 with a run scored and 2 RBI. Iggy Suarez went 2 for 5 with a RBI. Dominic Ramos was 2 for 5 with a run scored. Matt Goodson went 4 shutout innings allowing 2 hits. He walked 4 and struck out 3. Scott Shoemaker picked up the win in relief throwing 3 hitless innings allowing 1 walk. Savannah defeated Greenville 6-4. Matt Mercurio went 2 for 4 scoring a run and driving in another. Jeff Natale went 1 for 4 with 2 RBI. Ismael Casillas lasted 4 innings allowing 5 runs on 4 hits. He had 2 walks and 6 Ks. John Barnes went 3 innings allowing 1 run on 1 hit. He had 3 BB and 4 Ks. Player of The Night: Jay Johnson arrived in Portland just prior to game time and drove in the tying and winning run in the 12th inning while going 3 for 5. Last night, Durham edged Pawtucket 3-2. The PawSox had only 3 hits with Dustin Pedroia, Tyler Minges, and Enrique Wilson were all 1 for 4. Marc Deschenes went 6 innings giving up 1 run on 1 hit while striking out 5. Craig Hansen pitched 2 1/3 innings of hitless relief striking out 2 and walking 2. Tim Bausher blew the save and took the loss allowing a run in 1 2/3 innings of work. Portland got by Bowie 4-3. Luis Jimenez went 2 for 4 with a RBI to lead the attack. Phil Seibel went 5 innings allowing just 1 run on 2 hits. He srtuck out 7 and walked 2. Barry Hertzler got the save throwing 2 innings of hitless relief. Wilmington edged Winston-Salem 3-2. Jed Lowrie went 2 for 3 with 2 doubles and a run scored. Tommy Hottovy went 5 innings allowing 1 run on 5 hits. He walked 2 and struck out 5. Greenville got by Savannah 7-2. Jeff Natale went 2 for 5 with a home run and 3 RBI. Matt Mercurio went 2 for 4. Chris Jones threw 5 innings of no hit ball striking out 6 while walking 4. Tim Cox threw 3 innings of relief allowing 2 runs on 3 hits. He struck out 3. Player of The Night: Jeff Natale who went 2 for 5 with a home run and 3 RBI. In action on Thursday, Pawtucket edged Durham 5-4. Abe Alvarez started and went 6 innings giving up 4 runs on 5 hits while walking 3 and striking ouy 2. Craig Breslow got the win pitching 2 innings of no hit ball. He had 3 Ks. Dustin Pedroia went 2 for 5 with a home run. Hee-Seop Choi went 2 for 2 with 2 walks and 2 runs scored. Ron Calloway went 2 for 4 with a run scored. Portland had the night off. Wilmington downed Potomac 2-0. Luis Mendoza went 6 innings allowing 0 runs on 3 hits. He walked 2 and struck out 7. Jeff Corsaletti went 1 for 2 with 2 walks and a RBI. John Otness and Jon de Vries were also 1 for 2. Greenville defeated Kannapolis 8-3. Hunter Jones went 4 innings allowing 0 runs on 2 hits. He did not walk a batter and struck out 7. Kevin Guyette got the win in relief going 4 innings giving up 3 runs on 3 hits. He had no walks and 6 Ks. Jay Johnson went 3 for 5 with 2 runs scored. Chris Turner went 2 for 4 with a home run and 4 RBI. Player of The Night: Luis Mendoza of Wilmington who pitched 6 scoreless innings of 2 hit ball, striking out 7. Just as it seemed that Craig Hansen was starting to make progress on his change up, he was called up to AAA Pawtucket yesterday. Craig pitched in relief every four games, and pitched two innings each game. However, in Hansen's last outing, Craig pitched three innings, where he allowed his lone run so far this season. Hansen finished his AA Portland stint, Pitching 11 innings, striking out 12, walking 4 and allowing just 1 run. One of the biggest reasons why Hansen was sent down to AA Portland to start the year was to develop his change up. The Red Sox calling him up to Pawtucket may mean that he is major league ready. Nonetheless, it will be interesting to see how long he stays in Pawtucket. With the exception of Papelbon and Foulke, the Red Sox major league bullpen has struggled thus far. If the major league bullpen continues to struggle, it may only be a matter of time before we see Hansen pitching in Fenway again. In action last night, Durham defeated Pawtucket 6-2. Jon Lester started and took the loss. His record is now 0-4. He went 3 1/2 innings giving up 1 run on 3 hits. He had 4 Ks. Cla Meredith came on in relief and went 1 1/3 innings giving up 4 runs on 4 hits. Adam Stern went 2 for 5. Portland edged Altoona 3-2. Devern Hansack went 5 2/3 innings allowing 2 runs on 5 hits. He walked 2 and struck out 1. Randy Beam picked up the win going 1 scoreless inning while allowing 2 hits. Chad Spann went 2 for 4 with 2 RBI. Luis Jimenez also was 2 for 4 with a home run and 2 runs scored. Jeremy West was 2 for 4. Potomac defeated Wilmington 7-4. Adam Blackley started and went 5 innings. He allowed 1 run on 4 hits while walking 2 and striking out 5. Scott Shoemaker pitched 1 inning in relief giving up 3 runs on 3 hits.Ian Bladergroen was 3 for 4. Jeff Corsaletti and Claudio Arias both went 2 for 4. Greenville shutout Kannapolis 4-0 behind the strong performance of Michael Bowden who pitched 5 innings of 1 hit ball walking no one while striking out 9. Bubba Bell went 3 for 4 with 2 RBI. Yahmed Yema went 2 for 5. Player of The Night: Michael Bowden for his 5 shutout innings of work in which he allowed just 1 hit, 0 BB and struck out 9. Pawtucket was shut out last night 4-0 by Durham. Tyler Minges and Rodney Nye were both 2 for 4. Adam Stern went 1 for 4. Jimmy Serrano went 7 innings allowing 3 runs on 8 hits. He gave walked 2 and struck out 8. Portland lost 5-4 to Altoona in 11 innings. David Bacani went 2 for 4 with a homer while Luis Jimenez went 1 for 3 with a home run. Jose Vaquendo pitched 5 innings giving up just one run on 1 hit. He struck out 4. Edgar Martinez blew the save allowing 3 runs on 3 hits in 2 innings of work. Kevin Frederick took the loss allowing 1 run on 4 hits in 1+ inning. Wilmington defeated Potomac 6-3. Andrew Dobies started and went 6 innings giving up three runs on 5 hits. He walked 3 and struck out 2. Kyle Jackson threw three hitless, scoreless innings of relief. Andrew Pinckney was 2 for 5 with a RBI and a run scored. Kannapolis got by Greenville 10-8. Mike Rozier went 3 2/3 innings allowing 7 runs on 9 hits. He struck out 4. John Barnes went 4 1/3 innings allowing 2 runs on 3 hits. He took the loss. Bubba Bell was 2 for 5 with 2 RBI and 2 runs scored. Jay Johnson also went 2 for 5 with a RBI and a run scored. Player of The Night: Kyle Jackson who pitched 3 hitless, scoreless innings in Wilmington's victory. He struck out 3 and walked 1 in his relief role. PawSox Blog: Where are all the prospects? I suppose it's alot like the anticipation of a blind date: your friends have told you how good-looking and attractive this woman whom you've never met really is. As the big night approaches, you continue to buy into the hype, only to be sorely disappointed when you meet her at the restaurant (or bar, or Chuck E. Cheese) and realize that she is not the Paris Hilton your friends had spoken about. Well, if you are a Pawtucket Red Sox fan, you can certainly feel for the guy. Because all during spring training, your proverbial mouth watered in anticipation of David Murphy, Brandon Moss, and Craig Hansen gracing the beautiful McCoy Stadium grass this Spring, only to find out that they would return to friendly confines of Hadlock Field instead. The only benefit you had over the poor guy on the blind date is that you found out two days prior that this team was no beautiful celebrity actress, but rather a B-list star. With that being said, let's not take away what this team has done so far. Jon Lester, one of the few prospects who did catch the flight to Pawtucket, rather than Portland, has been on 65-75 pitch counts early on, and although he has not fared as expected early on (0-3, 8.64 ERA, 1.92 WHIP), let us not forget the immortal words of Jerry Remy in his critically-acclaimed "Watching Baseball" : a slump is only as long as your last (outing). Well said, RemDawg. Manny Delcarmen has looked phenomenal thus far, and as we speak, is with the ol' Beantown team after pitching 10 scoreless innings of relief while posting 10 puncharos (forgive my Espanol) in Pawtucket. Another pitcher enjoying early success has been Jermaine Van Buren, the ex-Cubbie prospect who was in Toronto with the Sox this past weekend before returning to the PawSox pen on Sunday. Van Buren has struck out six in four innings of scoreless relief. Not to be forgotten is southpaw starter Abe Alvarez, who has gone 3-0 while posting a sparkling 1.96 ERA in his four outings thus far. The PawSox hitters started off the season on a low note, scoring 3 or less runs during the opening series versus Indianapolis, and being blanked twice during those four games. The slow start can usually be attributed to the sub-arctic air that hangs over McCoy Stadium early in the season, and as the weather warmed, the frost began to melt off the bats. Speedy Ron Calloway has been on fire of late, hitting at a Williams-esque .404 clip with four doubles. Recently-demoted Adam Stern has already chipped in with a homer and a double in his two games back from Boston, while Hee-Sop Choi is doing his best Brian Daubach impression by absolutely feasting off of AAA pitching (3 HR, 20 TB, .297). Dustin Pedroia is back from injury, and hopes to continue his fast rise in the organization with a possible call-up before the season ends. Portland blasted Altoona last night 10-2. Matt Van Der Bosch went 3 for 6 scoring 2 runs. He had a home run and 4 RBI. Brandon Moss was 2 for 6 with a home run and 3 RBI. David Bacani was 2 for 4 with 2 runs scored. Alberto Concepcion went 2 for 3 with 2 runs scored and David Murphy went 2 for 5. Kason Gabbard got the win going 5 innings allowing 1 run on 5 hits. He walked 3 while striking out 5. Craig Hansen pitched 3 innings of relief allowing his first run of the season while giving up just 1 hit. He struck out 4. Potomac got by Wilmington 5-3 in 12 innings. Jed Lowrie and Andrew Pinckney were both 1 for 4. Gary Galvez started and went 6 innings giving up 3 runs on 6 hits while striking out 3. Justin Sturge pitched 3 scoreless innings of relief giving up 2 hits. He had 5 Ks. Ryan Schroyer took the loss allowing 2 runs in 2 2/3 innings of relief. He allowed 2 runs on 2 hits while striking out 4. Greenville got by Kannapolis 7-4. Mark Wagner went 3 for 3. He scored a run, had 2 doubles and 2 RBI. Ismael Casillas started and got the win going 5 innings. He allowed 1 run on 3 hits. He had 3 Ks. Tim Cox pitched 3 1/3 innings in relief allowing 3 runs on 8 hits. Pawtucket was idle last night. Player of The Night: Matt Van Der Bosch who went 3 for 6 with a home run and 4 RBI. He also scored 2 runs. In action on Sunday, Pawtucket shut out Buffalo 7-0. Matt Ginter went 8 innings allowing just 2 hits. He walked 1 while striking ot 6. Dustin Pedroia went 2 for 4 with a run scored and a RBI. Ron Calloway was 3 for 4 with a run scored and 2 RBI. Luke Allen went 2 for 4 with a homer and 2 RBI while Enrique Wilson was 2 for 3. Portland split a doubleheader with Harrisburg winning the first game 5-4 while dropping the second 3-0. In the first, David Pauley went 6 innings giving up 4 runs on 6 hits. He walked 2 and struck out 6. Luis Jiminez went 3 for 3 and scored a run. In the second, Chris Smith went 4 innings giving up 3 runs on 6 hits. He walked 3 and struck out 4. Jeremy West had the team's only 2 hits going 2 for 3. Wilmington edged Winston-Salem 4-3. Tommy Hottovy started and pitched 6 innings of no hit scoreless ball. Beau Vaughn pitched 2 innings of relief giving up 2 runs on 4 hits while Mike James pitched the final inning allowing 1 run on 4 hits. Finally Greenville blasted Savannah 12-1. Yahmed Yema went 2 for 5 with 2 runs scored and 3 RBI. Jeff Natale went 2 for 5 with a home run and 2 RBI. Chris Turner was also 2 for 5 with a home run, 2 runs scored and 2 RBI. Mike Leonard went 3 for 4 with a run scored and a RBI. Phil Seibel got the win going 5 innings while allowing 1 run on 4 hits. He had 4 Ks. Kyle Fernandes pitched 3 innings of no hit no run ball. Player of The Night: Tommy Hottovy who pitched 6 innings of no hit ball allowing 4 walks and recording 1 K.
Pawtucket defeated B uffalo 6-2. Adam Stern led the offense going 2 for 3 with 2 walks. He scored 2 runs and drove in another. Trent Durrington and Hee-Seop Choi were also 2 for 3. Marc Deschenes went 6 innings allowing 1 run on just 2 hits. He struck out 3. The Portland -Harrisburg game was postponed due to rain. Wilmimgton got by Winston-Salem 4-2. Jeff Corsaletti went 1 for 3 scoring a run and driving in a pair. Jed Lowrie was 1 for 4. He scored a run and drove in another. John Otness went 1 for 2 with 2 walks. Luis Mendoza went 5 innings allowing 2 runs on 2 hits. Kyle Jackson got the win pitching 2 shutout innings giving up just 1 hit. He had 3 Ks. Greenville lost the suspended game 6-5 to Savannah. Outfielder turned pitcher John Barnes went 3 1/3 innings in relief allowing 3 runs on 3 hits and 3 BB. Luis Soto singled to keep his hitting streak going. In the second contest, Greenville lost 5-1. Hunter Jones started and went 4 innings allowing 2 runs on 4 hits while striking out 5. He took the loss. J.T. Zink allowed 3 runs on 2 hits in 3 innings of relief. Only 1 of the 3 runs was earned. Luis Soto extended his hitting streak to ten games going 1 for 3. Chuck Jeroloman was 1 for 2. Player of The Night: Adam Stern who was on base 4 times going 2 for 3 with a pair of walks. He also scored a pair of runs and had a RBI. Player of The Night: Abe Alvarez who ran his record to 3-0, going 5 innings against Durham allowing 1 run. The first two weeks of the season have been very successful from a player development point-of-view, if somewhat less so from a win-loss perspective. Overall the Drive are 6-7. The pitching started off very hot; through the first 7 games, starters had pitched 33 innings and given up only 2 runs with a 32:5 K:BB ratio. The next three games (started by Mike Rozier, Mike Bowden, and Hunter Jones) were ugly with a combined 16.20ERA in 10 IP. The last three games (started by Phil Seibel, Clay Buchholz, and Mike Rozier) have been pretty good with each allowing 1 run in 5, 5, and 4 2/3 IP, respectively. Seibel has been the strongest, though he doesn’t have much to prove at this level, as this is strictly a rehab assignment. Next best has been Buchholz who’s had 3 really nice outings totaling 15 IP with 12H, 2ER, 15K, 3BB, and 1 HR. Bowden has had 1 good start and 1 ugly start, as has Hunter Jones. Mike Rozier has not been particularly impressive through two starts. The two best pitchers out of the bullpen have been Ismael Casillas (who was also impressive in one start) and Australian Tim Cox. Including his start, Casillas has pitched in 3 games with the following line: 10IP 2H 1ER 6BB 13K. Cox has pitched in 4 games, all in relief, with the following line: 11.1IP 7H 3ER 2BB 10K. On the hitting side, the offense has been led by two guys who in my opinion should have started at Wilmington. The 23-year old Jeff Natale is continuing his hot streak from last season. He’s currently hitting .375/.492/.646 with a 10:9 BB:K ratio in about 58 PA (Baseball America does not include HBP, SF, or S in their stats). I don’t know what this guy has to do to get a promotion. The next hottest hitter is 21-year old 3B Tony Granadillo who’s currently at .366/.438/.561 in about 46 PA with 5:9 BB:K ratio. 21-year old SS Christian Lara is having a very nice start to the season after a pretty terrible year at the plate in 2005. He’s hitting .286/.487/.393 with 10BB:7K and 6SB:1CS. RF Luis Soto (20yo) is starting the season well with a .310/.339/.500 line, though I’d like to see more patience as he has walked just 3 times in 58 at bats with 14 Ks. LF Chris Turner (22yo)is another guy who should probably be at Wilmington. He had a horrendous start to the season. In his first 7 games he hit .074/.242/.185 in 33 PA. In his last 5 games he’s gotten really hot, hitting .417/.462/.917 in 26 PA while cutting his K-rate significantly. 21-year old C Mark Wagner has also gotten hot after missing the first few games of the season with an injury. He’s currently at .372/.304/.500 in 22 at bats. As far as peple not getting off to good starts there are some who anyone could have predicted, including Logan Sorensen with his .532OPS and Matt Mercurio with his .500OPS, and some who are surprises at least to me, including Yahmed Yema who has been limited to a .212/.257/.273 line while missing several games due to injury. SS Luis Segovia has struggled mightily in his first exposure to full-season ball with just a .463OPS in 44 at bats. Overall, it’s great to see so many guys hitting, even if some of them should probably be at Wilmington. Nice starts by Natale, Granadillo, Lara, Soto, Turner, and Wagner on the hitting side, and Buchholz, Seibel, Casillas and Cox on the pitching side. Hopefully Mike Bowden will bounce back tonight after a tough start last weekend. The Drive come in to Charleston May 2-5 for a 4 game set. I’ll get to at least 2 and hopefully all 4 games, depending on how work is going. I’m excited to see these guys in person, though if the rotation stays the same (substituting Casillas for Seibel when he gets promoted to Pawtucket), it looks like I’ll miss Mike Bowden. I’ve got a new Nikon D50, so I should get some good pics as well. In Thursday's games, Pawtucket fell 8-3 to Durham. Ron Calloway went 3 for 4. Rodney Nye went 2 for 2 with 2 RBI. Jon Lester continues to struggle and lost his third game this year. He went 4 innings giving up 2 runs on 2 hits. He walked 2 and struck out 6. Portland were defeated by Harrisburg 5-3. David Murphy went 2 for 4 with a home run and 2 runs scored. Jose Vaquedano took the loss going 4 1/3 innings. He allowed 5 runs on 10 hits. Greenville blasted Savannah 12-1. Mark Wagner went 2 for 4. He had a homer, 2 runs scored and 2 RBI. Chris Turner also went 2 for 4 with a home run and 2 RBI. Jeff Natale was a perfect 2 for 2. He had a single RBI and scored 2 runs. Mike Rozier started and went 4 2/3 innings. He allowed 1 run on 6 hits. Tim Cox picked up the win in 2 2/3 innings of relief. He gave up 0 runs on 1 hit and recorded 4 Ks. Wilmington did not play. Player of The Night: Mark Wagner, the Greenville catcher, who went 2 for 4 with a home run, 2 runs scored and 2 RBI. Pawtucket blanked Durham by the score of 6-0. Jeff Bailey led the offense going 3 for 3. He scored 3 runs, had a homer and 2 RBI. Ron Calloway and Rodney Nye were both 2 for 4. Jimmy Serrano got the win pitching 6 innings giving up 5 hits while recording 6 Ks. Manny Delcarmen pitched 2 innings giving up 1 hit while striking out 2. Portland went down to New Britain 7-3. Keoni DeRenne was 3 for 4 with a run scored. Kason Gabbard took the loss going 3 1/3 innings. He allowed 7 runs on 5 hits and 4 walks. Craig Hansen pitched 2 hitless innings of relief. He walked 1 and struck out 1. Wilmington defeated Kinston 7-2. Mickey Hall went 2 for 4. He scored 2 runs and had 2 RBI. His hits were a triple and a home run. John Otness and Bryan Pritz were both 2 for 4. Andrew Dobies got the win pitching 5 innings allowing 2 runs on 2 hits. He had 3 walks and 4 strikeouts.Greenville was idle on Wednesday. Player of The Night: Jeff Bailey who was a perfect 3 for 3 with a home run, 3 runs scored and 2 RBI. In Tuesday's action, Pawtucket fell 9-6 to Durham. Tyler Minges went 2 for 3. Matt Ginter started and took the loss. He went 5 innings giving up 6 runs on 10 hits. Cla Meredith pitched 2 innings of scoreless relief allowing just 1 hit. Meanwhile in Portland, the Seadogs shut out New Britain 3-0. Chris Smith started and threw 7 innings of 1 hit shutout ball. He struck out 4. Edgar Martinez closed the game throwing 1 perfect inning. David Murphy and Chad Spann were both 2 for 4. Kinston defeated Wilmington 5-3 in 13 innings. Jacoby Ellsbury went 2 for 5 with a RBI while Jed Lowrie went 2 for 6 with a run scored.Gary Galvez started and went 5 1/3 innings allowing 3 hits on 3 runs. He struck out 3 while allowing 4 walks. Randy Newsome took the loss allowing 2 runs on 2 hits and 3 walks. He struck out 1. Greenville got by Columbus 4-2. Jeff Natale went 2 for 6 with a run scored. Luis Soto also was 2 for 6 with a RBI. Tony Granadillo was 2 for 6 with a home run. Matt Mercurio went 2 for 5 with a run scored. Clay Buchholz went 5 innings allowing just 1 run on 4 hits. He allowed 2 walks and recorded 6 Ks. J.T. Zink pitched the final 2 innings and got the win allowing 0 runs on 1 hit. Player of The Night: Chris Smith who threw 7 innings of 1 hit shutout ball. On Monday Pawtucket fell in Charlotte 6-4. Marc Deschenes got the start for the Pawsox and went 4 1/3 innings giving up 2 runs on 4 hits while walking 3 and striking out 3. Dustin Pedroia returned from the DL to go 1-5 with an RBI. Trent Durrington went 1-4 with 2 RBI's in the loss. In Portland, the Seadogs beat New Britain 3-0 in an afternoon affair. David Pauley was spectacular on the mound going 7 strong innings giving up no runs on 5 hits while walking 2 and striking out 3. Pauley with the win also lowered his era to 1.65 in the Eastern League. Edgar Martinez pitched a scoreless 9th striking out 1 to pick up his first save of the year. David Murphy went 1-3 with 2 RBI's and Jeremy West went 1-3 with an RBI to provide the Seadogs offense. In Wilmington tonight the Blue Rocks shutout Kinston 5-0. Tommy Hottovy went 6 strongs innings giving up no runs on 2 hits while striking out 7. Beau Vaughn also pitched 2 scoreless innings striking out 3. Jeff Corsaletti, Mickey Hall, and John Otness each had 2 hits apiece and Corsaletti also drove in 2 runs to lead the Wilmington offense. And finally Greenville beat Columbus tonight 8-5. Phil Seibel pitched 5 solid innings giving up 1 run on 4 hits while striking out 6. Tony Granadillo and Jeff Natale each had 2 hits and drove in 3 runs apiece. Christian Lara, Luis Soto, and Chris Turner each had 2 hits apiece as the Drive pounded out 13 hits in the win. Player of the night: Tommy Hottovy who pitched 6 shutout innings while giving up 2 hits and striking out 7 in Wilmingtons 5-0 win. On Sunday the Pawtucket Red Sox pounded the Charlotte Knights 10-3. Abe Alvarez pitched well for the Pawsox going 6 innings giving up 3 runs on 2 hits and striking out 5. Alejandro Machado, Enrique Wilson, and Willie Harris all homered for the Pawsox. Harris also chipped in with 3 RBI's and Hee-Seop Choi had 2 RBI's in the win. In Portland, the Seadogs fell to Binghamton today 8-2. Devern Hansack pitched well in the loss going 5 innings giving up 2 runs on 3 hits while striking out 8. Brandon Moss provided the offense going 2-4 with a homerun and 2 RBI's. In Wilmington, the Blue Rocks doubled up Salem 4-2. Luis Mendoza went 5 1/3 innings in the win giving 1 earned run on 7 hits while striking out 4. Jacoby Ellsbury had a triple and 3 RBI's. Bryan Pritz and John Otness each contributed with 2 hits apiece. And finally Greenville fell today in Columbus 9-5. Hunter Jones pitched for the Drive and gave up 6 runs on 10 hits while fanning 3. Jay Johnson went 3-5 with an RBI while Chris Turner, Jeff Natale, and Tony Granadillo all had 2 hits apiece in the loss. Player of the night: Brandon Moss who went 2-4 with a homerun and 2 RBI's. On Saturday Pawtucket fell at Charlotte 7-4. Jon Lester got the start for the Pawsox and did not fare very well. He gave up 5 runs on 5 hits in 2 innings of work while fanning 2 and taking the loss. Hee-Seop Choi went 2-4 to lead the offense. In Portland, the Seadogs downed Binghamton tonight 6-3. Jose Vaquendano started for the Seadogs and pitched 5 innings giving up 3 runs on 2 hits while striking out 3 and picking up the victory. Craig Hansen pitched well again going 2 innings giving up 1 hit and striking out 3. Alberto Concepcion led the offense going 2-4 with 2 homeruns and 5 RBI's. In Wilmington, the Blue Rocks beat Salem 6-2 tonight. Ian Bladergroen went 2-4 with a homerun and 3 RBI's. Claudio Arias also hit a homerun and drove in 2 runs and Mickey Hall went 2-4. Adam Blackley started and went 4 innings giving up 1 run on 5 hits and striking out 3. Kyle Jackson got the win in relief going 3 innings giving up 1 hit and striking out 5. And finally Greenville tonight was beat by Columbus 9-5. Michael Bowden struggled for the Drive tonight pitching only 3 innings giving up 7 runs on 8 hits while striking out 3. Luis Soto and Chris Turner each had 2 hits and a RBI in the loss. Player of the Night: Alberto Concepcion who went 2-4 with 2 homeruns and 5 RBI's in Portland's 6-3 win. The Boston Red Sox placed starting pitcher David Wells on the disabled list on Saturday, and called up right-handed pitcher Jermaine Van Buren from Pawtucket. 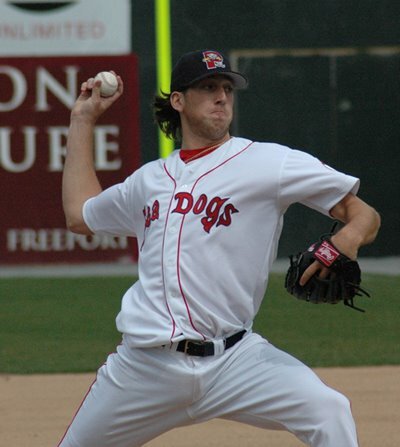 Van Buren, rated 15th on soxprospects.com top 20 Red Sox prospects, had worked four innings in two relief appearances for the PawSox, posting six strikeouts without giving up any runs or walks. This will be Van Buren's first call-up to Beantown; last season, he was called up in late-August by his former team, the Chicago Cubs, and made six relief appearances, while posting an ERA of 3.00. Hunter Jones has thehttp://www.blogger.com/img/gl.link.gif potential to be the best pitcher in the bullpen and may be the first option should one of the starters get injured or stumble out of the gates. He signed as an undrafted free agent after the 2005 draft out of Florida State. He has great potential, though also has a long injury history which is the main reason he wasn’t drafted. After signing, Hunter appeared in 12 games for Lowell (1 start) going 1-1 with 1 save in 28 IP with a 3.21ERA. He gave up 29 hits and 5 BB while striking out 30. I’m a big fan of Hunter, though he’s a significant injury risk. Tim Cox is a LHP out of Australia who will turn 20 in July. He impressed in his first exposure to pro ball last year in the GCL where he pitched 49 innings on 5 starts and 11 games total. He ended up with a 2.19ERA while giving up only 37 hits and only 7 walks while striking out 56 batters. His 8:1 K:BB rate and 10.3K/9 were fantastic. I’m somewhat surprised he didn’t get a rotation spot based on those stats, however I’ve heard Tim is only about 5’9” 165#, so the Sox may think he’s better off as a reliever. Kyle Fernandes (LHP, 20yo) will be interesting to watch. He was taken in the 12th round in 2005 out of Massasoitt JC in Massachusetts. He signed and went to the GCL where he pitched very well, totaling 43IP in 11G with a 3.60 ERA. He gave up 34 hits with 10 BB while striking out 47 batters. Of note, he had a 2.2 G/F ratio which was 2nd on the team in inducing ground ball outs. Kyle was roughed up a bit in his one and only appearance in Lowell at the end of the season. He went 2 innings and gave up 3 runs on 5 hits and a walk, though he did strike out 3. I’ve heard he hits 90mph with his fastball, though it’s his deception and breaking balls that get him his outs. We’ll see how he fares against more advanced hitters. I suspect there will be a period of adjustment, though I think he’ll succeed at this level. He’s one of the guys who will have to prove himself at each level. I’d like to see him get some starts, but I’m not sure it’s in the cards for Kyle. Blake Maxwell (RHP) will pitch out of the bullpen for the Bombers. He was drafted in the 40th round in the 2005 draft out of Methodist College. He tied for the most appearances for Lowell last year with 26. He pitched 45.2IP with a 2.76ERA and gave up just 31 hits and 11 BB while striking out 29 and allowing only .505 OPS against. Blake was an extreme groundball pitcher, with a 3:1 ratio of GB:FB. We’ll see how he does this year against more advanced hitters. His K rate is low, but that’s not as important for groundballers. Still it’s something to keep an eye on. Blake will turn 22 on July 1. Kevin Guyette (RHP) is returning to Greenville after a successful first professional season in 2005. Kevin was drafted in the 10th round out of the University of Arizona in the 2005 draft. He went to Lowell pitching in 6 games, going 2-1 with 2 saves in 11.2 shutout innings. He allowed just 3 hits and 1 BB while striking out 10 and allowing a .213OPS against. That’s not a misspring. Kevin was promoted to Greenville where he got into 12 games with 3 starts. His final line was 30.1IP 3.26ERA 30H 6BB 2HR 28K. It’s a little surprising to me that Kevin was not promoted to Wilmington to begin the season. If he pitches well he may be proomted. Kevin will be 23 for the full season. JT Zink (RHP) was drafted in the 8th round out of Everett CC after his sophomore year and signed for $75K. He was sent to Lowell and started 14 games, pitching 48IP with a 2.63ERA, 46H, 18BB, 1HR, and 26Ks. The walk and stikeout ratios aren’t very good, but he got by. JT had a slightly above average G:F ratio at 1.6. If JT doesn’t pick up his K and K:BB rates he will likely run into trouble. JT will turn 21 in May. Matt Hancock (LHP) was drafted in the 27th round out of Oral Roberts University. He was assigned to Lowell where he put up a 5.59 ERA in 37IP, alhttp://www.blogger.com/img/gl.link.giflowing 45 hits and 11 BB with 34 K’s. He allowed a lot of power, especially for the NYP League, with a .510 SLG against. He throws a high 80s fastball and a slider. He’ll be 23 for the whole season. Jay Johnson was taken in the 17th round out of Xavier University. After signing he went ot Lowell where he hit .273/.337/.386 in 252 PAs. He impressed this spring and won the backup OF job from Bubba Bell, , and Jason Twomley. Jay will be 23 for the entire season. Chuck Jeroloman was taken in the 21st round as a all-glove-no-hit shorstop out of Auburn University in the 2004 draft. Sent to Lowell, he got 186 PAs and hit just .170/.285/.230 while striking out 61 times (for an amazing 32.8% K rate). He was kept around for his glove and last year actually showed something with the bat hitting .236/.386/.371 in 324 PA with 60BB and 91Ks at Greenville. He got out to a hot start, went on the DL, then came back to earth, ending up with the above line. This year he’ll back up at 2B, 3B, and SS. Chuck is 23. Matt Mercurio will back up at the hot corner. Matt was taken in the 16th round out of Florida Southern University. Sent to Lowell he hit just .225/.341/.307 in 276 PA, though he did show good patience with 33 BB. Matt looks to improve on that mark this season. I haven’t seen a scouting report on Matt so hopefully I’ll see him in a few weeks. Matt will play the season at age 23. Mark Wagner was drafted in the 9th round of the 2005 draft out of UC Irvine after his junior season and signed for $90K. His college career was very good, hitting .355/.398/.495 his junior year. His professional debut didn’t go at well as he would have liked as Mark hit just .203/.309/.261 in 81 PA in Lowell. It doesn’t look like the Sox think too much of him since 26 year old Leonard is starting over him. Mark will turn 22 in June. EDIT: It appears that Mark had food poisoning and missed the first few games, but will be the primary catcher in Greenville. On Friday Pawtucket took to the road and came away with 5-4 win over Charlotte. Jimmy Serrano gave up 3 runs in 4 innings of work while striking out 5. Alejandro Machado and Rodney Nye had 2 hits apiece to lead the offense. In Portland, David Murphy's RBI force out won it in the 10th inning. Matt Van Der Bosch went 2-5 and Jeremy West added a 3-run homer. Kason Gabbard went 5 1/3 innings giving up 2 runs while striking out 5. Edgar Martinez pitched 1 2/3 scoreless innings in relief striking out 4. In Wilmington the Blue Rocks fell to Salem tonight 6-5. Andrew Dobies pitched well in the loss giving up 2 runs in the loss on 5 hits while striking out 3. Jacoby Ellsbury led the offense by going 3-4 while scoring 2 runs and stealing his 3rd base of the season. Jed Lowrie chipped in with 2 RBI's. And finally the Greenville Drive fell tonight 8-4 in Augusta. Tonight marked the return of Mike Rozier who spent the last few weeks in extended spring training. Rozier went 3 innings giving up 5 runs on 4 hits while striking out 4 and walking 2. Logan Sorensen lead the Drive's offense by going 2-4 with an RBI. Player of the Night: Jacoby Ellsbury who went 3-4 with 2 runs scored and a stolen base. After a 4-3 16 inning loss last night Pawtucket shutout Rochester 5-0 by the strong pitching of Matt Ginter who went 5 innings while giving up no runs on 4 hits and striking out 3. Enrique Wilson went had two-run homer in the win. In Portland, the Seadogs were shutout by Binghamton 3-0. Chris Smith pitched 6 1/3 innings while giving up 2 runs on 5 hits while striking out 4. Jeremy West went 1-3 in the loss. Wilmington finished its series with Kinston in 4-1 loss. Gary Galvez went 5 innings in the loss giving up 3 earned runs on 5 hits. Jed Lowrie provided the offense by going 2-4. Finally Greenville shutout August 9-0 on the strong pitching of Clay Buchholz who went 5 innings giving up no runs on 4 hits and striking out 3. Luis Soto went 2-4 with a walk and run scored and Jeff Natale went 2-5 with 2 RBI's. The #1 catcher will be Mike Leonard. Mike was an undrafted free agent signed after the 2004 draft out of UCONN and will turn 26 in a May (obviously a little old for A- ball). Mike played in the GCL in 2004 and was not very impressive. He hit .237/.343/.258 in 108 PA. Moved up to Lowell in 2005 he hit .300/.375/.386 in 80 PA. In his career, Mike has a nice 21:21 BB:K ratio, though he’s not shown much power. Hopefully Mark Wagner or Mitch Stachwosky will take over soon. Mitch is recovering from mono (who’s he been kissin’ on?) and should be back soon. Logan Sorenson will man first base for the first part of the year. He was drafted as a senior out of Wichita State in the 19th round. After signing he got 48 plate appearances at Lowell, hitting .273/.292/.432 with 2BB and 4K. 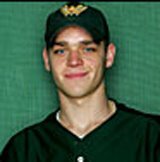 In 2005 he played 93 games for the Bombers putting up a line of .225/319/.314, not exactly what you’re looking for out of your first baseman, especially considering that he was not only a college player, but he was also a senior. I’m not sure why he’s still in the organization, but he’ll get the majority of starts for at least the beginning of the season. He’ll play most of the year at 24 years old. Personally I’d like to see Mike Jones or Jesus Garcia or even Jason Twomley get time at 1B. However, I think the Sox like to have a few “veterans” on each minor league team just to show the young guys how to act and go about their business. This may be his function. Purely based on talent and production, I’m surprised he’s starting. Hopefully he’ll prove me wrong. Jeff Natale and Luis Segovia will split time manning the keystone position this season. Natale is probably somewhat disappointed at being reassigned to Greenville this year after tearing it up last year. Taken in the 32nd round in 2005 out of Trinity College, he was assigned to Lowell where he put up a 1.131OPS in 46 pa. He was quickly promoted to Greenville where he continued his hot streak with a .336/.463./544 line in 201 plate appearances. He only struck out 14 times while walking 28 times (and adding 11 HBP) and hitting for 25 extra base hits. Apparently his defense is a big question and this is supposedly the reason he was not promoted to Wilmington to begin the year. Interestingly, he started the most of the first games of the year at DH, which is strange if he’s supposed to be working on his defense. Anyway, I’m a little biased. Jeff will play most of the season at 23 years of age. I don’t think he’s long for South Carolina. Luis Segovia will turn 20 in July and is one of the Sox Venezuelan prospects. In the VSL in 2004 (as a 17-18 year old) he hit .300/.416/.390 while playing shortstop. He showed good patience with 43 BB in 286 PAs, however he had some trouble making contact as he also struck out 47 times. He also showed good speed with 21 SBs, but he was somewhat raw, getting caught 13 times. The Sox thought enough of Luis to bring him over to the US last year. In the GCL he showed a similar skill set, walking in 10% of his PAs, while striking out 19% of the time. His stolen base percentage went up with a 12:2 ratio. Overall Luis hit .267/.348/.340 in 184 PA. Scouting and tools wise, I don’t know much about Luis, though I suspect he’s a plus defender at 2B given that he used to be a shortstop. If he can gain a little more power as he matures while keeping his fielding skills and patience, he could be an interesting prospect. Tony Granadillo is one of my favorite lesser-known Sox prospects. He was taken in the 2004 Rule 5 Draft (AAA phase) out of the St. Louis organization. He hits whenever he plays, however his problem is that he can’t seem to stay on the field because of injuries. Last season he got into 67 games at Greenville hitting for a .291/.384/.427 line in 271 plate appearances in his 20 year old year. I was a little disappointed that he was sent back to Greenville instead of being promoted to Wilmington, but that seems to be a recurring theme. It is somewhat more understandable than Natale or Turner (who we’ll get to soon), but I still don’t have to like it. Hopefully with a good start, he can move up in June or so. Christian Lara returns to Greenville to man shortstop. He was somewhat disappointing last year after a great 2004 season after which BA ranked him the Sox #12 prospect (ahead of Hall, Murphy, Meredith, and others) and Sickles ranked him #8. That 2004 season started out at the GCL where he hit .433/.493/.633 in 67 PA with 10 XBH, 7:10 BB:K, and 8:0 SB:CS before being promoted to Lowell. In Lowell he got 146 PA and ended up with a .277/.404/.336 against mostly college trained players while he was just 19. As a 20 year old in the SAL last year he hit just .232/.304/.299 with a 37:90 BB:K rate and just 6 steals while getting caught twice. He did play a good defensive shortstop, however. His age 21 season this year will be very telling as to whether or not he’s actually a prospect. Christian is currently ranked as the #16 best prospect by BA and is not ranked in the top 20 by John Sickels. Chris Turner (for some reason it keeps telling me that "the tag is broken" when i try to link his page) has a right to be among the most disappointed prospects in his placement to start the season. All he did last year at Greenville was hit .281/.361/.515 in 338 PAs. Granted, he did have a problem with contact, striking out in 25% of his plate appearances, but when he makes contact it’s usually solid. Chris was taken in the 15th round in the 2003 draft out of Texarkana JC and signed for $140K (approximately 5th round money). He did not impress in his first two seasons, though he showed a little promising power potential in the GCL in 2004. His problems the first two years were a lack of contact and a lack of patience. In 2004 his line in Lowell was .241/.265/.395 in 170 PAs. 2005 was his breakout season at Greenville in his 21 year old season, though he still had the contact problem. BA didn’t rank him going into this season (kind of surprising for a guy with his tools), but John Sickels ranked him #19. Hopefully he’s pissed off and takes it out on the pitching of the opposition. If he starts out as well as he ended last year, he could be part of a domino effect with Murphy going to Pawtucket, Corsaletti going to Portland, and Turner going to Wilmington. Chris will be 22 for the entire season. EDIT: Not a good start to the season for my boy. 3 errors and lots of K’s. Hopefully he’ll turn it around. Yahmed Yema was drafted in 2005 in the 7th round out of Florida International University and signed for $90K. John Sickles loves this guy and pegged him as a sleeper before the draft. He ranks him #15 in the Sox system (he's not ranked by BA in the top 30). He had a great junior season with a line of .391/.467/.676, showing great patience and some power. Assigned to Lowell after signing he did OK, not great, but not terrible either. His final line was .301/.350/.411 in 237 PA which is actually pretty good in a league that favors pitchers as much as the NYP league does. He showed good strike zone judgement with a 17:21 BB:K ratio and flashed a little speed with an 8:1 SB:CS ratio. He impressed this spring and will play center field for the Greenville this year. Yahmed will be 21 for the entire season and if he makes the majors will be the first major league player ever with the initials YY. Luis Soto begins his 2nd year playing outfield, after making the switch from shortstop. Last year was a little rough for Luis, both offensively while at Greenville, and defensively. After signing for $500K our of the Dominican Republic in December of 2003, and hitting .261/.289/.470 in the GCL in 2004, he was ranked #7 in the system by BA (#9 by Sickles). The Sox promoted him to Greenville at the beginning of 2005 and Luis struggled at the plate, in the field, and emotionally. Apparently the Sox didn’t like Soto’s work ethic and attitude and when those were combined with his pathetic .212/.247/.259 in 89 PA he was brought back to extended spring training to get things straight. When the Spinners began playing in June, Luis was firmly planted in right field. He impressed with the bat, though he has a long way to go with the glove. In 281 PA he hit .293/.377/.431 showing patience for the first time and displaying good power. Most agree that Soto has the best tools of any Sox position prospect, with perhaps the best power potential, good speed and a great arm. He currently ranks #11 by BA and by Sickels. If he continues to show that plate discpline and power, he could develop into the prototypical right fielder, though he’s several years away. Luis will anchor the lineup in Greenville, hitting 4th. I’m really looking forward to seeing him when Greenville comes through Charleston this summer. Luis will play the whole season at age 20. Unless he absolutely crushes the league, I think the Sox will keep Luis in Greenville to get at bats and work on his fielding for the majority of the year.